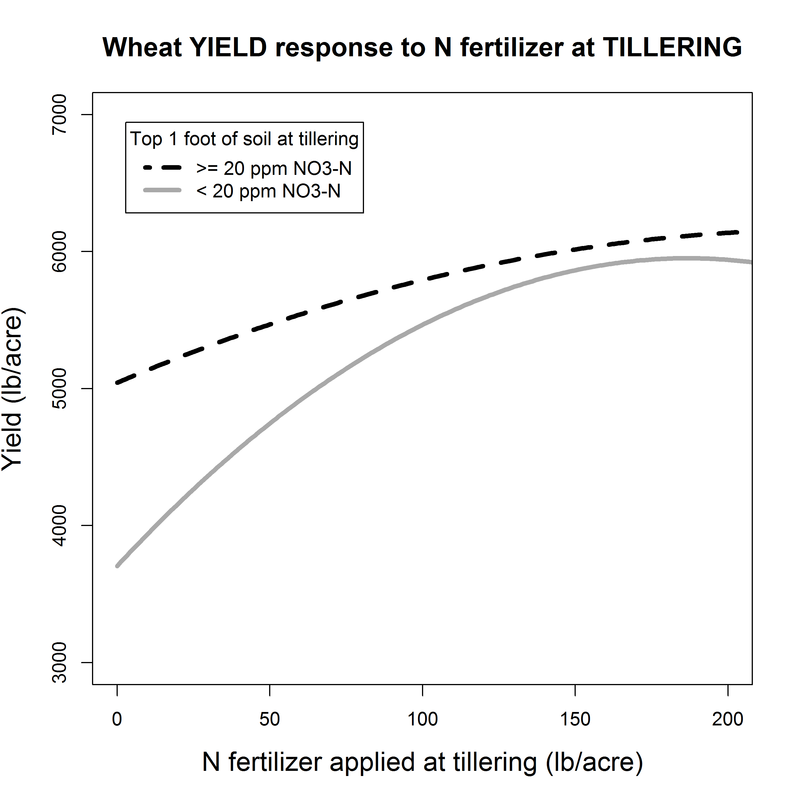 We have received several recent inquiries following on our blog post from late January that discussed the potential value of a nitrogen (N) topdress at the tillering-to-jointing stages of wheat growth. This is particularly an issue with the higher than average precipitation we have experienced in California this year. The current question is whether a topdress of N might still be beneficial to wheat crops that are in the late-boot to early-heading stages of growth. Although fall-planted wheat crops in the southern portion of the state may have already progressed beyond this stage of growth, depending on when they were planted, fall-planted crops in the northern part of the state may still be in this window of development. 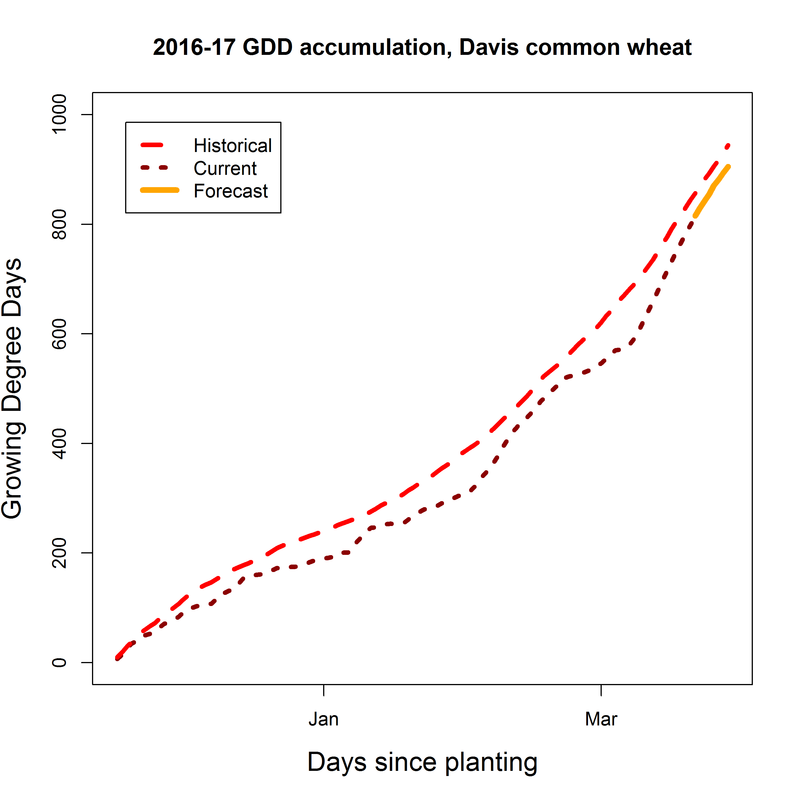 For example, our UC small grains variety test plots located in Davis and planted on 11/17/16 have accumulated 830 growing degree days (GDD) to date. Figure 1. 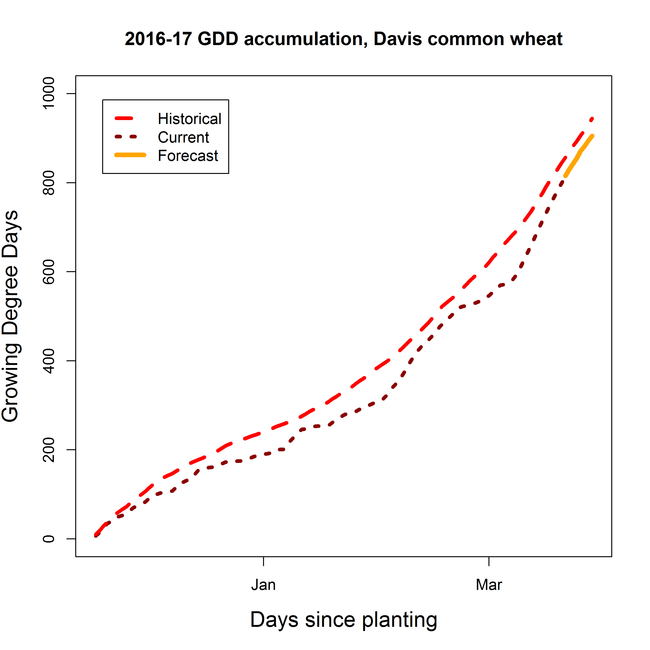 Cumulative and forecasted Growing Degree Days (GDD) at the UC small grain variety testing program Davis location since planting on 11/17/2016 compared to a 10-year average over the same period. Depending on the maturity rate of a particular variety in the trial, the wheat growth stages at this site range from approaching the boot stage to very early heading, which generally agrees with Table 1 here (To calculate GDD for your site and planting date, use the calculator available here–be sure to scroll to the bottom of the page to find the tool and use upper and lower thresholds of 86 and 45 °F). In our recent work measuring the value of in-season N applied at various stages of crop growth, we have observed that, overall, topdress applications of urea at the late-boot to early-heading stages are of relatively greater value than an equivalent amount of N applied pre-plant (Figure 2). Figure 2. Effect of 60 lb/acre fertilizer N applied as urea either pre-plant or at the late-boot/early-heading stages of growth on hard spring wheat grain yield (left) and protein concentration (right). Figure is based on 9 site-years at 3 locations in the Sacramento Valley, the San Joaquin Valley and the Intermountain Region of California. Enough water must follow the fertilizer application to both incorporate the applied N into the root zone and avoid crop water stress during the remainder of the season. 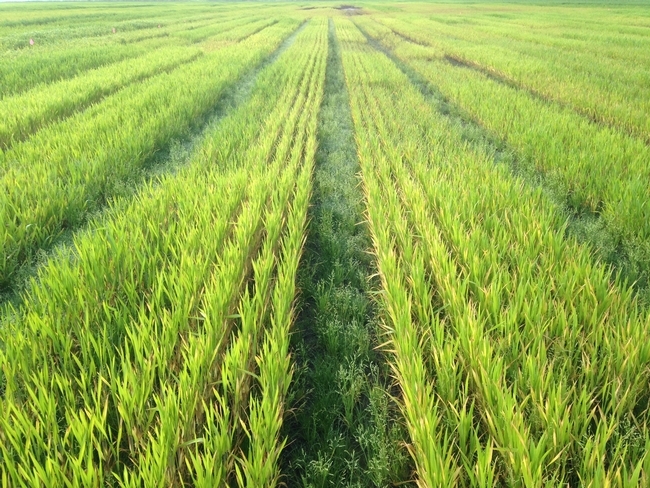 The response to applied N at this stage of growth depends on the available supply of N in the root zone at the time of application. Unless an in-season topdress of N was applied earlier in the season, soil nitrate (NO3-N ) concentrations in the top foot of the soil will likely have decreased since the tillering-to-jointing stage owing to the increasing plant biomass and N uptake since that time. 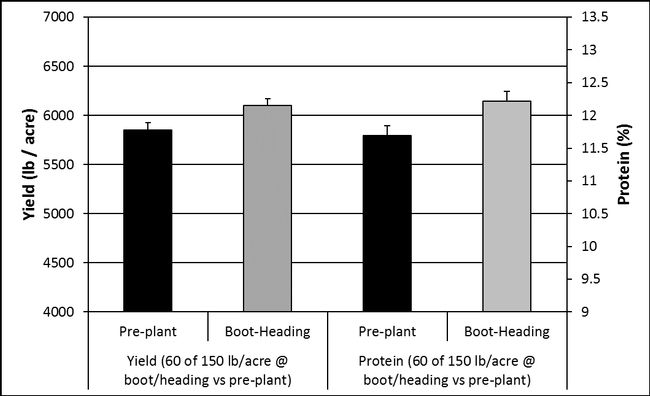 In our trials, we found that when NO3-N concentrations in the top foot of soil were less than 7 ppm at the late-boot/early-heading stage, the likelihood of a response to N topdress was greater than when NO3-N concentrations were greater than 7 ppm. Distinguishing between 5 and 10 ppm NO3-N may be difficult using our simplified version of the soil nitrate quicktest. 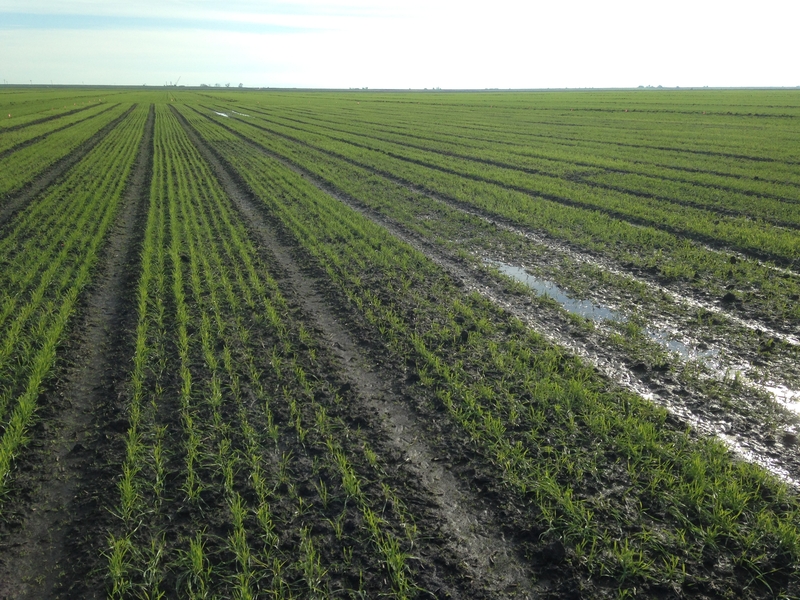 Therefore, unless soil nitrate-N concentrations are extremely low, a laboratory analysis may be the better choice for soil nitrate-N determination at this stage. Regardless, our trials also indicate that, at the late-boot/early-heading stage, the plants themselves are probably the better indicator of N sufficiency/deficiency and likely response to fertilizer N.
The degree of response will be greater in crops demonstrating signs of plant N deficiency versus crops that do not exhibit N deficiency at the time of application (Figures 3 & 4). To determine deficiency/sufficiency in our trials we used a combination of proximal sensing devices, a Greenseeker canopy NDVI meter and an AtLEAF leaf chlorophyll meter, and found that they were most effective at detecting deficiency when used in combination. Determining site-specific sufficiency/deficiency via these tools is most reliable when using an N-rich strip (For a general discussion of the use of N rich strips, click here. To discuss further in the California context, feel free to contact us). Earlier work by our UC colleagues indicates that stem NO3-N levels < 4000 ppm at the boot stage are indicative of N deficiency (For more information on this sampling protocol/interpretation see Table 1 and the last paragraph of p.3 here). The Western Fertilizer Handbook sufficiency range for the top 4 leaves at boot are 2.7 – 3.5% N (This table and additional information can be found under the ‘Plant Analysis' link here). Figure 3. 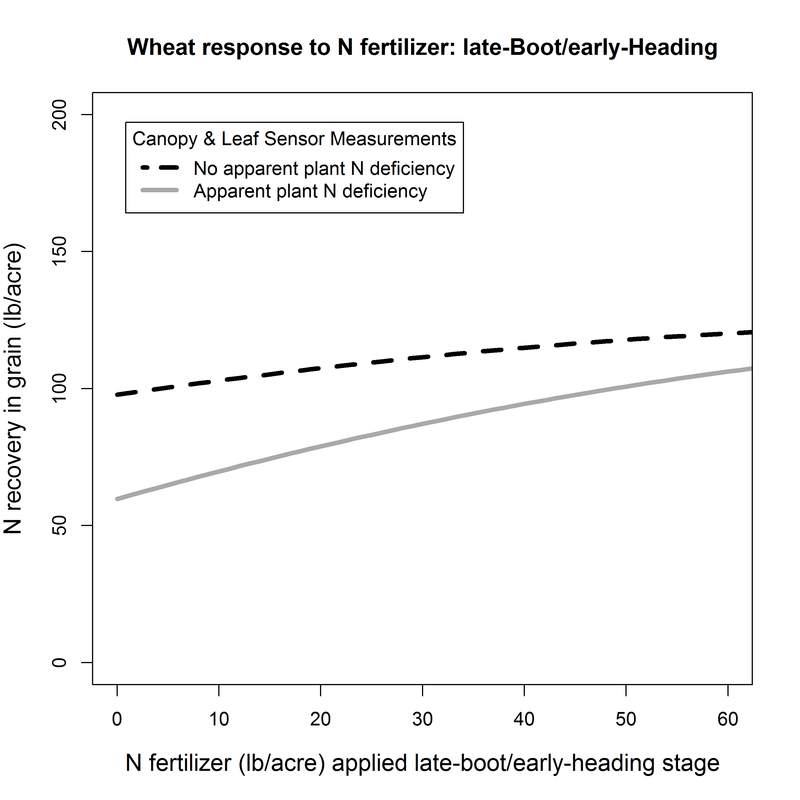 Response (N recovery in grain [lb/acre]) of hard spring wheat to varying rates of N fertilizer applied at the late-boot/early-heading stages of growth in crops that did (solid grey line) or did not (dotted black line) display leaf and/or canopy symptoms of N deficiency at the late-boot/early-heading stages of growth. Figure is based on 11 site-years at 4 locations in the Sacramento Valley, the San Joaquin Valley and the Intermountain Region of California. Figure 3 represents the overall grain N recovery— that is: the additional grain yield AND the increase in grain protein concentration (expressed as N concentration) as a function of applied fertilizer N at the late-boot/early heading stage. 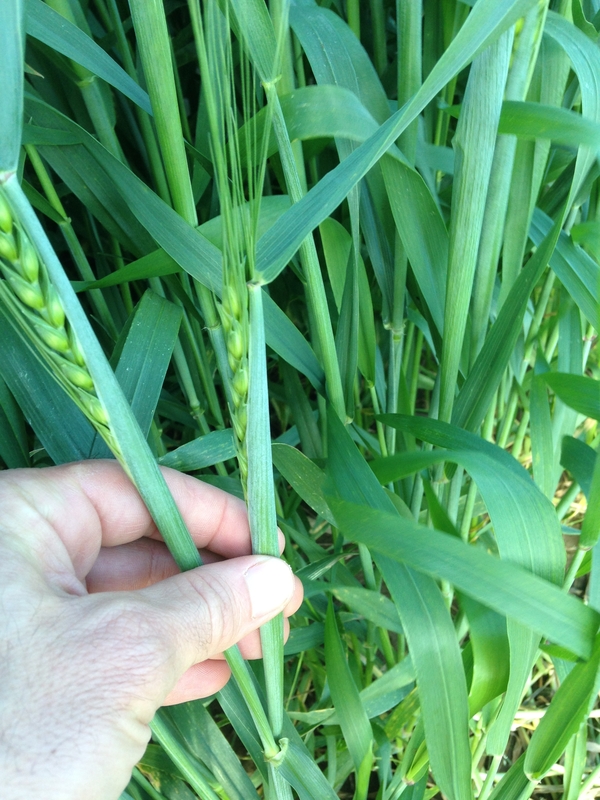 Both sufficient/deficient crops will likely see a bump in grain protein from applications at this stage. Figure 4. 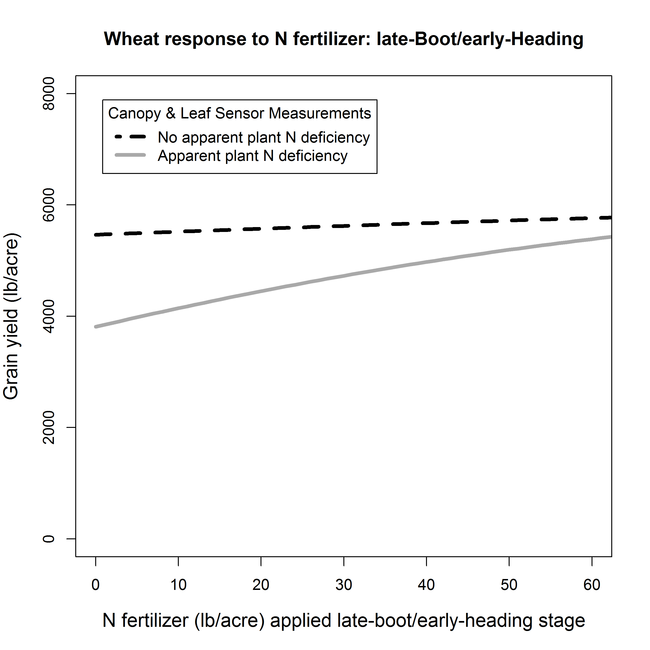 Yield response (lb/acre) of hard spring wheat to varying rates of N fertilizer applied at the late-boot/early-heading stages of growth in crops that did (solid grey line) or did not (dotted black line) display leaf and/or canopy symptoms of N deficiency at the late-boot/early-heading stages of growth. Figure is based on 11 site-years at 4 locations in the Sacramento Valley, the San Joaquin Valley and the Intermountain Region of California. 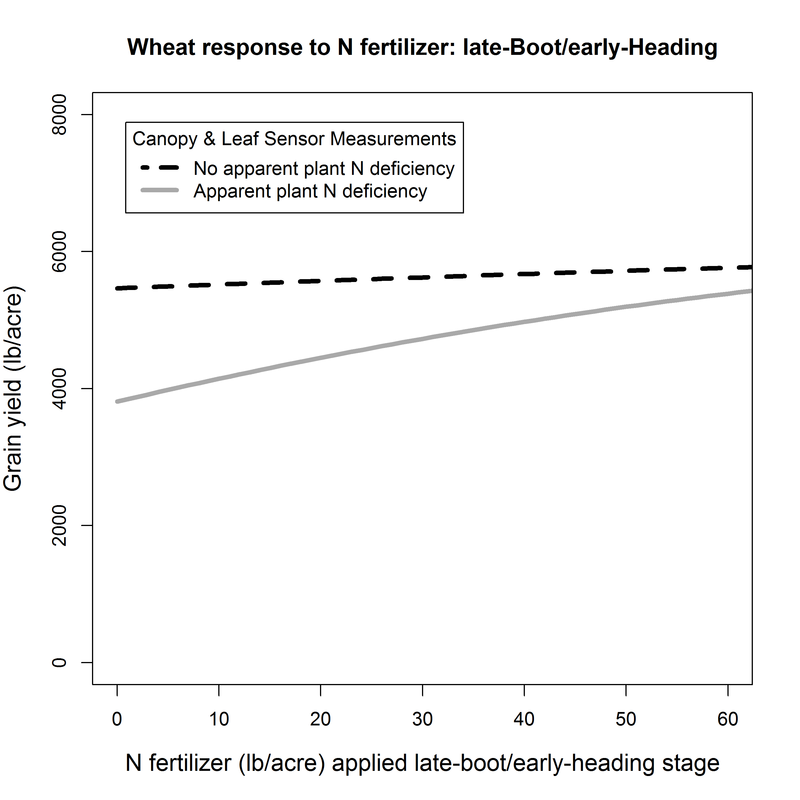 Setting contributions to grain protein aside, Figure 4 indicates that fertilizer N can increase grain yield at the late-boot/early-heading stage for crops demonstrating symptoms of plant N deficiency at the time of application. However, N topdress is less likely to increase yield in plants that are not showing symptoms of N deficiency at this stage. For a fertilizer N application to increase yield at this stage, the crop must have sufficient yield potential given its measureable yield components. 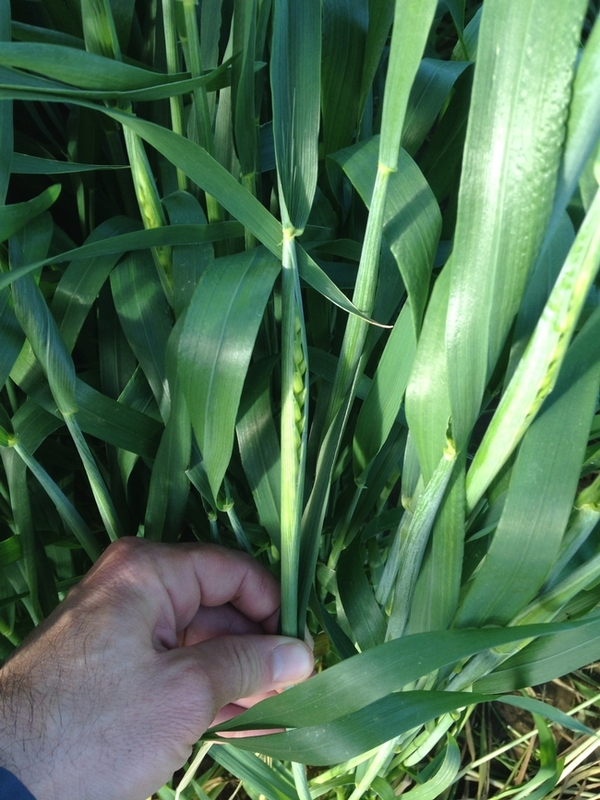 At the late-boot/early-heading stage, the number of reproductive tillers (or tillers that are forming spikes) is starting to become visible/measureable, and the spikes per area will be the best guide as to whether the crop still has sufficient yield components to make use of an N topdress at this growth stage. Although there is some variation among varieties, for a widely grown hard white spring wheat (Patwin515), we have measured that 20 ± 2 spikes per linear foot on 6” row spacing (or approximately 40 spikes per square foot) are needed to achieve yields of 6000 lb/acre. While it may be possible for a crop to compensate for < 40 spikes ft2 by increasing the number of seeds it sets and/or its grain size, the proportion of total yield that can be changed by these subsequent yield components is relatively limited. Likewise, N management actions at this stage have proportionately smaller influence on overall crop productivity than at the tillering-to-jointing stages of growth. Although the crop is in the midst of a peak period of demand at the late-boot/early-heading growth stage, there is less absolute demand for fertilizer N remaining at this point in the season relative to the tillering-to-jointing stages of growth. For example, observe the range of values on the horizontal axes in Figure 3 and 4 above (0-60 lb/acre) compared to the horizontal axis at the tillering-to-jointing stage in Figure 5, below (0-200 lb/acre). In other words, there is less to gain but also less to lose at the late-boot/early-heading stage as compared to a topdress decision earlier in the season. Figure 5. 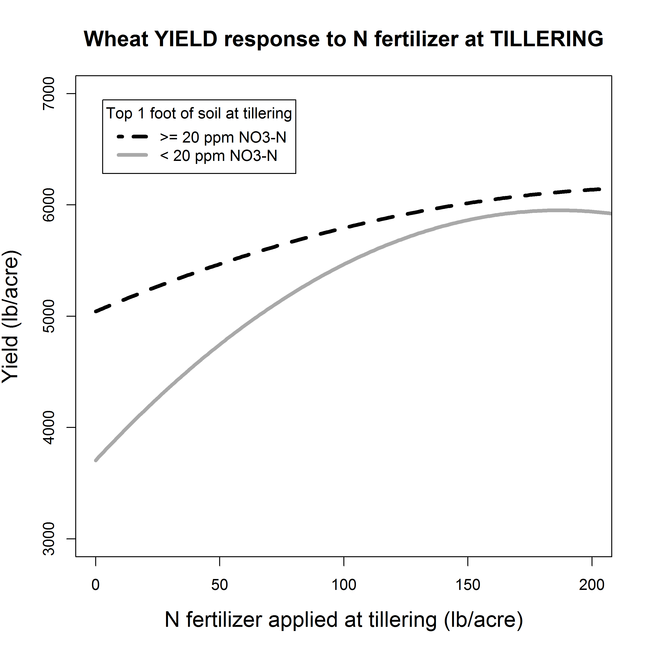 Response of hard spring wheat to varying rates of N fertilizer applied at the tillering-to-jointing stages of growth where soil nitrate-N concentrations in the top 1 foot of soil were either ≥ 20 ppm NO3-N or < 20 ppm NO3-N at the time of application. Figure is based on 7 site-years at 3 locations in the Sacramento Valley, the San Joaquin Valley and the Intermountain Region of California. A final consideration: the above average rainfall totals this season have been welcome in a state coming out of a multi-year drought. However, the excessive precipitation, particularly in the northern portion of the state, has had a negative impact on yield potential for some crops due to waterlogging and associated symptoms and an increased opportunity for nitrogen losses due to leaching and other water-related N loss pathways. Figure 6. 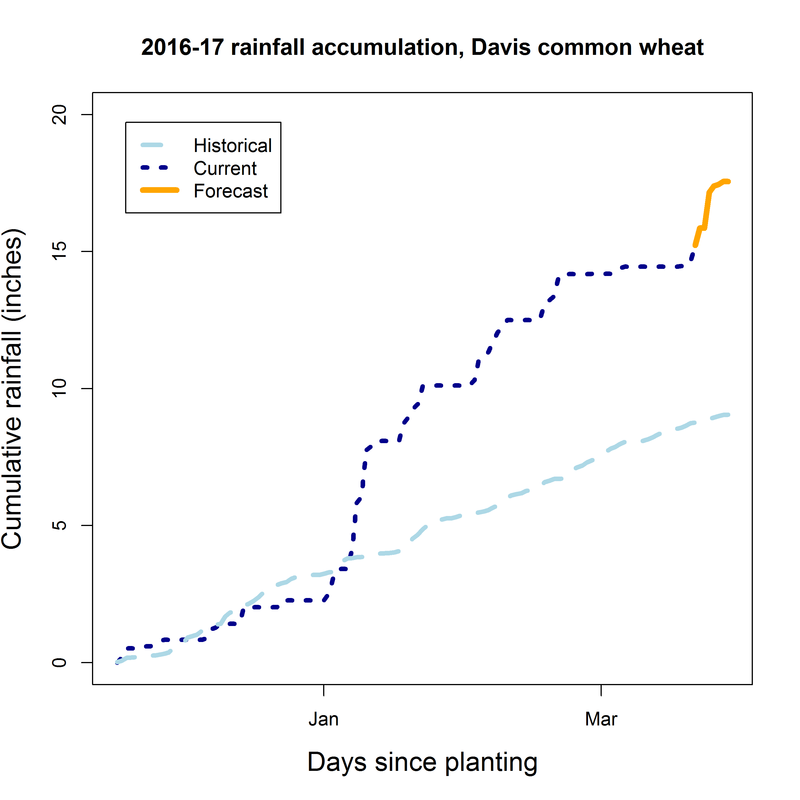 Cumulative and forecasted rainfall at the UC small grain variety testing program Davis location since planting on 11/17/2016 compared to a 10-year average over the same period. For example, the UC small grain variety testing plots located in the Delta region, where we observed waterlogging as early as 1/6/17, now has plants that are stunted, chlorotic, and weed infested. Image 1. 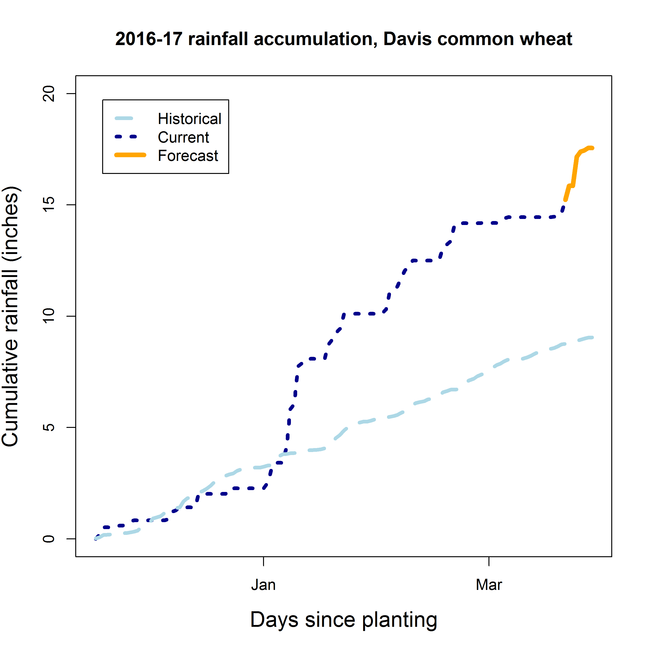 UC common wheat trial located in the Delta pictured on 3/16/17 after extended periods of waterlogging stress throughout the season. For a crop like this, where the yield potential has been greatly reduced, the cost of N application at this stage of growth is not likely worth the benefit it may provide to the crop. To summarize: late-boot/early heading stage applications can increase yield and protein for wheat crops, particularly those demonstrating symptoms of N deficiency. However, the proportional response to N fertilizer application is lower at this stage as compared to earlier stages of growth, and crops with reduced yield potential may not respond sufficiently to an N topdress at this stage to warrant the cost of application.